Be the first to share your favorite memory, photo or story of Tywanna. This memorial page is dedicated for family, friends and future generations to celebrate the life of their loved one. 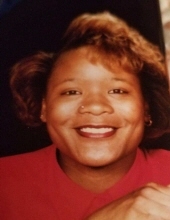 Mrs. Tywanna La'Vette Jackson Hill, 52, of Glennville, Ga. passed away on Sunday, March 17, 2019. The Tattnall County native was a clerk at Parker's Convenience Store in Glennville, Ga.
She is survived by her husband: Tim Hill of Glennville, Ga., a daughter Paris L. Smith of Glennville, Ga. , Sisters: Charlette Mobley of Miami, Fla., and Raven Gibbons of Savannah, Ga., brothers: Charles Mobley, Jr., and Clinton Mobley II both of Miami, Fla., James Gibbons, Jr. and Henry Gibbons of Savannah, Ga.,step-father James Gibbons of Savannah, Ga., dear and special aunt Jacquelyn Parker of Miami, Fla., Cynthia Mobley of Perry, Fla. , Clintonia Holzendorf of Savannah, Ga. and Clinette Mobley of Bradenton, Fla., uncles: Donnell Mobley and Ernest Rouse of Savannah Wells of Miami, Fla., god sons of Wyking Davis, David Peak of Miami, Fla. and Kito Lamar Coe, Jr., of Glennville, Ga. and a host of cousins, other relatives and friends. To send flowers or a remembrance gift to the family of Tywanna La'Vette Hill, please visit our Tribute Store. "Email Address" would like to share the life celebration of Tywanna La'Vette Hill. Click on the "link" to go to share a favorite memory or leave a condolence message for the family.